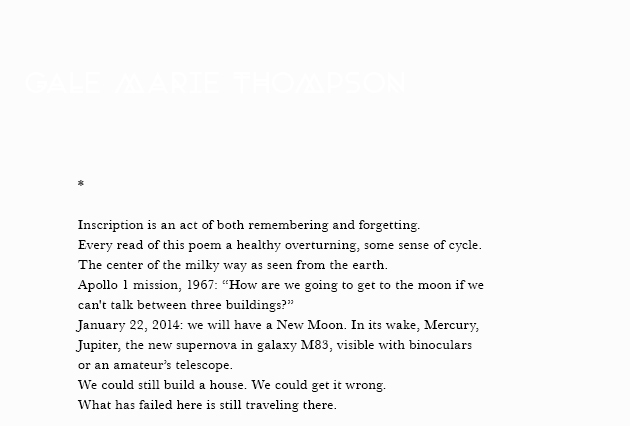 Gale Marie Thompson is the author of Soldier On (Tupelo Press, 2014) and two chapbooks, Expeditions to the Polar Seas (Sixth Finch) and If You’re a Bear, I’m a Bear (H_NGM_N). Her poems have appeared or are forthcoming in Colorado Review, Souvenir, Columbia Poetry Review, Better, The Volta, Guernica, and others. She edits Jellyfish Magazine and writes, teaches, and lives in Athens, GA.